The Matrix metronomes are highly accurate, loud enough to hear while playing and most importantly . . . affordable. The MR600 boasts many features not even found on more expensive metronomes. 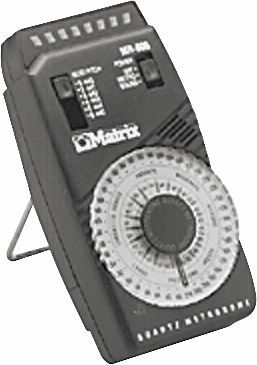 Matrix MR-600 Metronome Matrix has built its reputation on economical alternatives to higher-priced metronome models. The MR-600 features an easy-to-use dial, A440 reference pitch, 40-208 BPM tempo range, LED display, and a personal earphone. Also features volume control, LED pendulum simulation, audible click upbeat sound with chime downbeat, and variable tone generation.